This Jo Ral straight mute with brass bottom has a slightly deader tone than their usual aluminium model due to the addition of brass. This cuts some of the buzzier tone from the normal aluminium model so players wanting something less zingy may appreciate it. The straight mute is very common and perhaps it's the most widely used because of its ability to complement a host of musical styles—delivering an exciting tonal quality with near-perfect intonation. 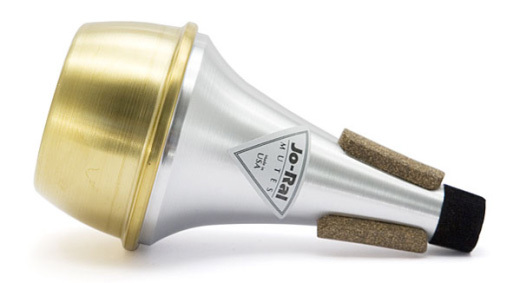 Lightweight and easy to use, Jo-Ral straight mutes are a favorite of trumpet players at every level and in any discipline, from classic jazz players to symphonic musicians. Made of the highest quality hand-spun aluminum with a brass bottom end, Jo-Ral TPT-1A Trumpet Straight Mutes are designed and tested to perform evenly in all registers. Jo-Ral mutes also feature neoprene-enhanced composite cork pads that provide extra durability. The result is a more pliable cork that grips well and doesn’t dry out, become brittle or break off—so it lasts longer while easily accommodating fine adjustments for a perfect fit.